We have one less child living with us. As I had mentioned in one of my past posts’ our daughter Krista has graduated from college and found a job about 2 hours away. So this past weekend she was home for a visit and I couldn’t resist baking her something to take back to her new home. She is a breakfast person like I am; one of those people that can eat the minute their feet hit the floor. So I like to make something like muffins or scones that will freeze well and won’t need to be eaten after a couple of days or they go bad. 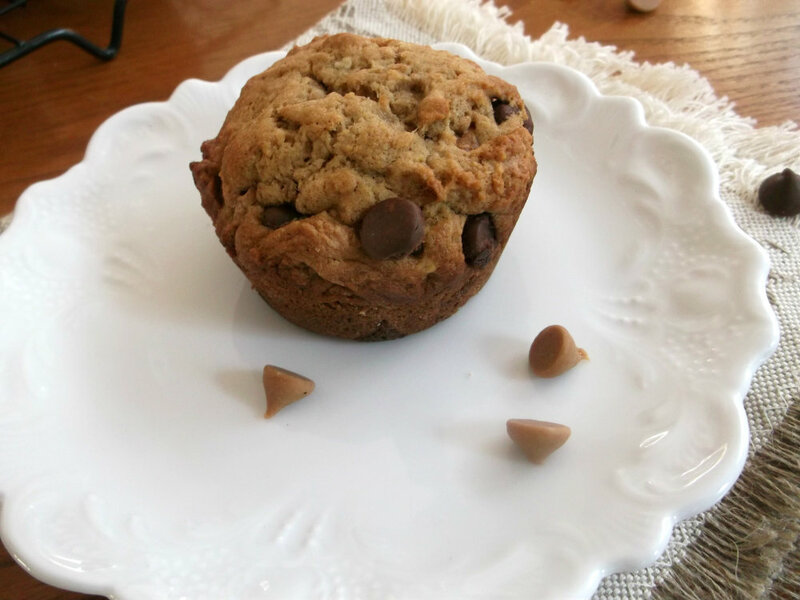 Krista is a big fan of peanut butter and so I thought it would be fun to find a recipe for peanut butter muffins. I found a recipe that not only included peanut butter, but also banana, chocolate chips, and cinnamon. The combination of ingredients was a little intriguing to me. I decided on making this recipe, because I wanted to see if the ingredients would all blend together to make something tasty, I wasn’t quite sure on the cinnamon. 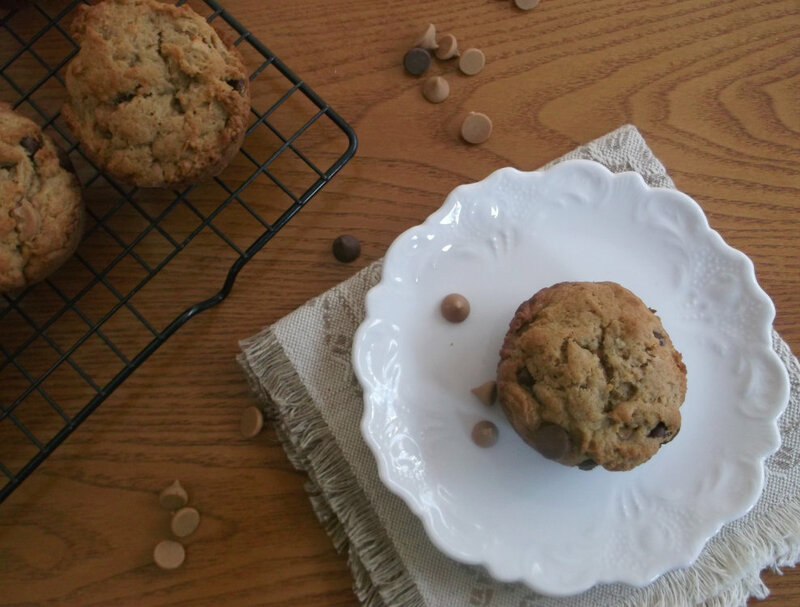 I decided to change it up a little too; I decided to change out some of the all-purpose flour for some whole wheat and half the chocolate chips for some peanut butter chips. I did take one little sample of the muffins to satisfy my curiosity, I was amazed how well the flavors blended together. Krista was happy with them and hopefully she will enjoy them in the coming days. Preheat oven to 375 degree F. Grease or line muffin tins. In a large bowl mix together 1 cup of all-purpose flour and wheat flour, baking soda, baking powder, salt, and cinnamon. In a second bowl beat together the mashed bananas, peanut butter, sugar, vanilla, egg, and melted butter. Stir the banana mixture with flour mixture just until combined. In a small bowl mix the chips with the 1 tablespoon of flour (this will prevent the chips from sinking). Stir the chips into the batter. Spoon batter into the muffin tins fill to 2/3 full. Bake in preheated oven for 12 to 15 minutes or until a toothpick inserted into the center of a muffin comes out clean. (Note: The muffin batter I found was a little thicker than the average muffin batter, but that will be fine). I bet she was very thankful to get these delicious muffins! 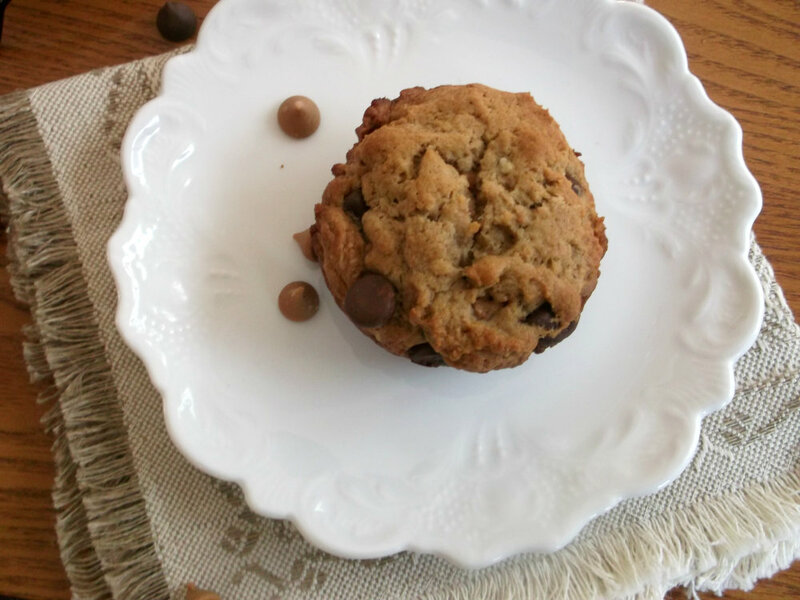 My husband will love this muffin…banana and peanut butter in one of his favorite combination. I sure would love to have one for breakfast. Cinnamon is such an interesting spice – it blends in ways you wouldn’t think (and other times doesn’t work at all). These sound terrific – loads of protein in all that peanut butter – perfect to keep one going all morning! Good stuff – thanks. Mmm… I made these today and was really impressed with their flavour. I did use cocoa oil instead of butter. A lovely, moist muffin!